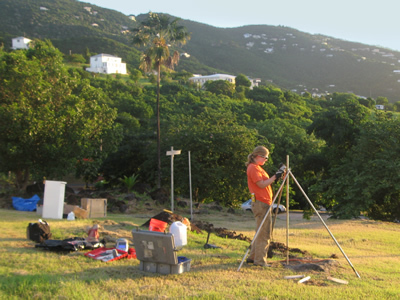 UNAVCO Engineers Sarah Doelger and Ellie Boyce recently completed the last three of six new CGPS stations located on several islands in the Caribbean. All six stations will be incorporated into the Puerto Rico Seismic Network (PRSN) which is a division of the University of Puerto Rico, Mayaguez. The first installation this October took place on Mona Island, a flat, 11 square kilometer outcrop of limestone forty miles to the west of Puerto Rico. The second station was installed 90 miles east of Puerto Rico on the US Virgin Island of St. Thomas. Finally, the third station was built on Culebra Island which lies just off the east coast of, and also belongs to, Puerto Rico. The six GPS stations are co-located with velocitymeter and accelerometer equipment and now complete a real time broadband earthquake observation system. The combined instruments will record much longer period seismic waves, which is critical to monitor large earthquakes (e.g., M>8.0), particularly tsunamigenic earthquakes, and study long-period earthquake ground motions. The true size and tsunami potential of these earthquakes can be determined accurately using only 15 minutes of GPS data after the earthquake initiation. Long period seismic waves, as well as permanent ground displacement information, are critical for detecting tsunamigenic earthquakes. High-rate (1-Hz) GPS is a good tool for earthquake studies and understanding fault rupture and its induced strong ground motions. 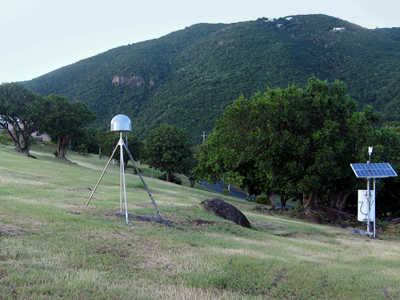 Thus these recently installed GPS stations will be crucial for scientist at the PRSN who are developing a tsunami early warning system in the Caribbean. Figure 1 - UNAVCO engineer Sarah Doelger prepares the monument on St. Thomas for welding. Figure 2 - The completed monument on St. Thomas Island. 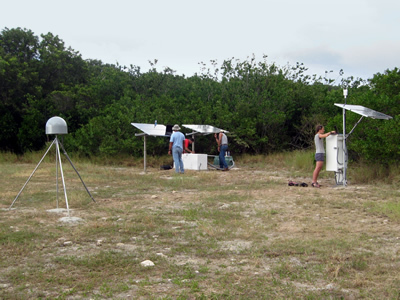 Figure 3 - UNAVCO engineer Ellie Boyce configures the GPS receiver as the team from the UPRM test the solar panels for their co-located seismic equipment.